Home Guest Posts A teacher and SEND parents asks: is inclusion working in schools? 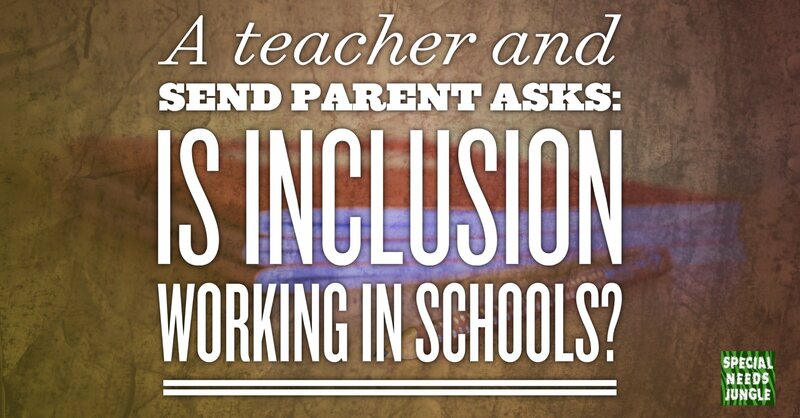 A teacher and SEND parents asks: is inclusion working in schools? Yesterday, I was in London talking to a group of head teachers and SENCOs at the Bridge School in Islington at the Inclusion Conference, organised by the National Education Trust. I’ve written at length about our experiences as a family with both mainstream and special education; I’ve commented on some of the reasons why more and more children with SEND are moving to special schools, rather than staying in the mainstream sector. I, like many teachers, and many parents of school age children, tend to think that Education-with-a-capital-E is the be-all and end-all of everything. It dominates almost every aspect of our lives – but, and this is, from my perspective as a teacher, a sad thing to admit, it does not hold all the answers. It can do a lot, but not everything. Outside of our Edu-Bubble there is a world of birthday parties and discos and scouts and brownies, and inclusive ideas need to be there too. After that, I talked about lots of things that teachers might not be aware of. I spoke of how many people, me included, are afraid of special schools (or I was), of what it might mean for their children and for them. How many people worry that the school, rather than being what it is, which is a place of hope and joy and celebration, will resemble something more like the institutions of days gone by. We fear that our children will be shut away, hidden from public gaze; dirty little secrets. I talked about that thing that we want: that our children are accepted and valued in society – and that they get to go to as many birthday parties as everyone else, and how we want mainstream education to help us in this aim. The thing is, though, that there are considerable obstacles in our way, and the first of these is in the field of teacher training and knowledge about SEND in mainstream schools. SEND is still seen as a specialist field, the SENCO is often expected to be the fount of all SEND knowledge. Many teachers, as are many people outside of education, are scared and intimidated by SEND, especially significant and complex needs like my son’s. They feel they ought to be experts, and they know they aren’t. This is compounded by the yearly nature of schooling. We, both parents and teachers, tend to grit our teeth and ‘get through the year’ if it isn’t going especially well – and we tend to forget all about it when we get on to the next stage. Lessons don’t seem to get learned. I talked about TAs. I didn’t feel the need to go into the details, but Sam’s heart was well and truly broken when he lost his TA. We wanted him to go on to a school where he was expected to stand on his own two feet, but still. It was hard on him. It wasn’t fair on him, and it wasn’t fair on her. It wasn’t fair to tie her job to the needs of a child. It’s not fair to invest such interest. And then I talked of the home-school relationship. I talked of how my expertise, as the parent of a child with an at-birth diagnosis, much involved in everything he did, wasn’t welcomed by many of his teachers. I reminded them that the biggest expert in my child was me, not them. I told them how easily it could happen that I, and parents like me, were misinterpreted by schools. That out there, beyond the school gate, the world is scary, that our anxiety levels are higher. I told them some of the upsetting things that people have taken it upon themselves to say to me, to help them understand how things can be different to what they first appear – that what may seem as RARGH is actually HELP or even MEEP! For so many of us, the home-school relationship is defined by conflict. And then we discussed how policy decisions and inspection systems don’t help, even when we have the best teacher, and the best home-school relationship in the world. We talked about how the results and competition agenda don’t exactly work with the inclusion one, and how children like mine, and the ones I teach, are the victims. I told them how, when you add it all up, it means one great big struggle. And to be honest, parenting a child like mine, one with significant special need, is struggle enough. We get sicker, we are tireder, we are under more stress than typical families. We’re tired of constantly having to explain, we’re tired of having our voices disregarded. We don’t need the added stress, and so we fall into special education with a sigh of relief – here, at least, are people who understand. I talked about where we might go from here. I talked about how the new Code of Practice, for all its faults, acts as a metaphor for special needs. It’s hard to pin down, it demands we see SEND for what it is – complicated, not neatly defined. I talked about how, once we have the labels we need to peel them off the children and put them back in their boxes. I talked about how, although it was hard going in mainstream, my son changed lives. He changed the lives of his teachers and of his classmates. They hug him when they see him. But what we really need is more than this. What we need is for all of us to see beyond the labels, to see that, just like the crystal hedgehog that sits on my mantelshelf, people will see my son for who he is; just as multifaceted and complicated as the rest of us. That, as well as opening their hearts, they will open their minds. Here’s to the future. It’s in our hands. I read this on return from coffee with a friend with a daughter with cerebral palsy. I hope she won’t mind me speaking for her. Her decision as a mother was that despite her child’s multiple and profound physical disabilities, she needed the stimulation and interaction with her cognitive equals in mainstream school. This has presented multiple challenges for both the family and school and not been an easy road. The range of needs that an average special school cater for is vast. One could argue that they are better placed to do this because they are funded for smaller classes and better child to staff ratios. But surely it follows that if Mainstream Schools were properly funded and allowed the flexibility to adapt the curriculum to meet individual needs they would be equally well placed to do this. ‘Inclusion’ should be a right not a choice. Anything else is discrimination and making it seem like anything else is just plain wrong. After a terrible time at MS primary school, my son (HFA and comorbidities) moved to an ASD special school. The school wasn’t your stereotypical special school in that it did provide opportunities to do GCSEs. As it was my son wasn’t well enough to pursue many GCSEs. Nevertheless he loved his school. It was essentially a secondary school on a much smaller scale which helped my son move round from class to class and to make friends. Many people say to me that he should have gone to mainstream secondary school because he could have learnt ‘social skills’ from ‘normal’ children. Some say that his attendance there would have taught normal children about autism. The reality is that my son would not have coped in such a huge school and probably would never have left the additional resource centre which was a building stuck to the main school. Being stuck in a building attached to the main school is NOT inclusion in my opinion which is one reason why I chose an ASD specific school where the environmental/sensory inputs could be better managed. Furthermore, the idea that my son (and children like him) should teach others about autism potentially risks my son’s education. I’m all for equality and diversity BUT the education of children like mine should never take second place to educating others about the importance of accepting disability. Similarly the idea that my son learns social skills from non-autistic kids is not something I buy into either. He is what he is, autistic, and whilst he can be taught some social skills it isn’t something that he acquires naturally from being with neurotypical people. In any case, he should never be pressured to conform to a non-autistic way of living particularly when we’re supposed to be supporting diversity! For me, inclusion would never have happened for my son in a MS school mainly due to the size of the school, numbers of pupils, lack of understanding of ASD and rigid academic curriculum. It is highly likely that if he did go there he would have ended up mentally unwell, holed up in his bedroom and out of education for good. In his special school he became part of the community and made friends with like minded people. Consequently he was able to build up his confidence and self esteem and be able to start at mainstream college though I have to admit that his first year in college was challenging. The lack of transition (we tried but no one wanted to help) plus poor understanding amongst college staff of high functioning autism/aspergers and associated difficulties, meant that my son really struggled to settle and we had to battle to keep his place. Fortunately we kept it and he’s now doing better but really we need to be doing better than this! I believe children have a right to be included in specialist education where staff are trained and the equipment and environment optimise their chances of achieving the best education the are able to achieve. Not struggle along at the bottom in mainstream. Unfortunately inclusion to LA means just abandoning them in a mainstream school with no support for school, inadequate EHC plans/provision. Totally agree about the lack of accountability. I found it depressing that the individuals responsible for my children’s poor schooling and their subsequent decline were not made responsible and carried on in their jobs appearing not to have learnt anything from my children’s situation. I found the board of governors unprofessional and not critical enough of the school and as for ofsted, SEND was never on their agenda when my kids were at MS primary school. It was sickening to read in the local paper that the school were ranked outstanding while my kids were forced out of school due to health problems brought on by lack of support. I’m sure I would have found it easier to come to terms with our situation if people had been made responsible and lessons were learnt. Sadly I speak from our experience. My little man aged 5 was recommended special needs school but as a parent who believed in the reforms I chose mainstream. From an early diagnosis and placement with the CDC I thought we would be adequately supported, assessed and monitored, that the school would be supported and empowered. Unfortunately lack of quantified and specified provision, collaborative working between education health and care, poor reviews and transitions has left me challenging the systems.